It’s easy to look at The Caine Mutiny as an actors’ showcase. Humphrey Bogart chews up the scenery and gives an iconic courtroom speech that stands alongside Nicholson’s work in A Few Good Men. Fred MacMurray excels at playing a morally flexible soldier, and a quiet Van Johnson struggles with the burden of removing his superior. Even the bland Robert Francis gets a lot of time on screen as the idealistic young newbie. We recall these guys playing off each other, but that focus pushes aside the other predominant theme on the destructive power of war. Adapted from a Pulitzer Prize-winning novel by Herman Wouk, this film doesn’t glamorize life at sea during World War II. The Caine is a beaten-down vessel that needs an extended stay at dry dock. Instead, it’s given a new captain and pushed to the front once again. We spend limited time in battle with this crew, but the impact of war stands out on the face of guys like Bogart’s Captain Queeg. His obsessive ticks help cope with the horrors that play constantly in his mind. He desires control over every detail yet has little ability to secure his own impulses. A cynicism about institutions and authority permeates the story, even when it’s patriotic on the surface. 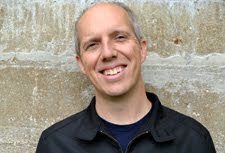 It was directed by Edward Dmytryk, a member of the Hollywood 10 that eventually testified in front of the House Un-American Activities Committee. Dmytryk did not write the adaptation, but it’s fairly easy to connect his experiences to this tale. When the government prosecutors grill Francis’ Willie Keith and Johnson’s Steve Maryk about their involvement in the mutiny, it easily connects to the anti-communist investigations. Maryk spends the final act with a pained look that reveals the turmoil beneath his choice to mutiny against Queeg. It’s like he’s carrying a giant weight on his shoulders, and even ultimate vindication won’t remove that burden. The real scar on Johnson’s face seems fitting given the emotional scars he’s carrying for this choice. The stoic Johnson is the right choice to play a well-meaning guy thrust into an unenviable position. He gets no joy out of removing the unfit leader from his position. Johnson remains in the background while we stick with Keith for the first half, but he’s a lot more interesting once the plot kicks into gear. The mystifying part of The Caine Mutiny is how much time we spend with Keith and his story away from the ship. The conflict between his devotion to his mom (Katherine Warren) and love for singer May Wynn comes from a lesser story. Francis’ flat vocal delivery stands out next to pros like MacMurray and Bogart. He’s a young guy with the right look but is in over his head. That sense actually works for his time on the ship because Keith is new to war. The problems appear when he’s separated from the army. Wynn (who took the character’s name as her stage name) has charm but can’t do much with Keith and the predictable domestic material. Disregarding the lesser parts, this story clicks as a tight drama. Queeg’s presence keeps everyone on edge, even a smooth guy like MacMurray’s Tom Keefer. Queeg disrupts the ecosystem of The Caine with more than just careless orders. The courtroom scenes are gripping, particularly due to a knowing performance from Jose Ferrer as defense attorney Barney Greenwald. The way he rips apart Queeg’s façade is frighteningly precise. He takes no joy in it and knows it will destroy a man’s career. It’s eerily similar to the way Chuck disintegrated in Better Call Saul this year. Once the house of cards breaks, the fall is swift and destructive. There’s a gripping 90-minute courtroom drama trying to break out of the two-hour film. On the other hand, it could work as a three-hour epic with more back stories for the other characters. Instead, The Caine Mutiny straddles the middle and provides great scenes and lost moments. Led by Bogart’s stunning performance, the actors keep us invested through all the ups and downs. Regardless of screen time, the cagey veterans rarely miss a beat. 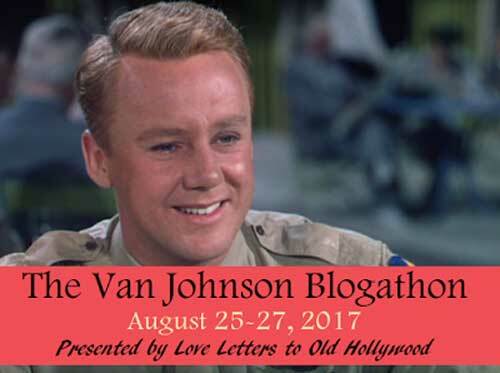 This article is a contribution to the Van Johnson Blogathon hosted by Michaela at Love Letters to Old Hollywood. Check out all the great articles from this blogathon here. I really like this movie a lot. I'm a huge fan when an actor plays hugely against his or her known type and does it well. Having Bogart play a craven martinet works so well, and the same could be said of Fred MacMurray as well. He's remembered as playing nice guys, but his best roles--this, The Apartment, and Double Indemnity--have him being either morally questionable or outright nasty. MacMurray is so good at playing a charmer with no moral center; I had no idea when I was younger after seeing him as The Absent-Minded Professor. I was stunned by Bogart's performance, and I'm a big fan of his. It's something to see. Great post! It's been a while since I've seen this film, but I remember being stunned by the performances of Bogie, MacMurray, Johnson, and Ferrer. I'll definitely be recording this the next time it appears on TCM. Thanks for bringing one of Van's best to my blogathon! Thanks Michaela! It was my first time seeing the movie, and I was not disappointed. The performances make it worth digging through a few lesser parts. The final act is amazing, and everyone is at the top of their game. 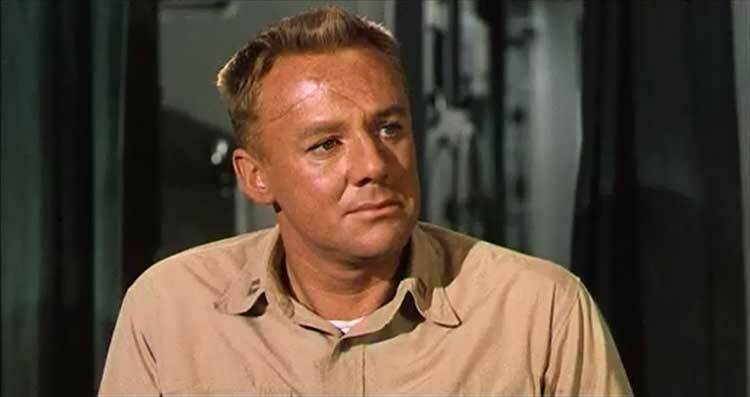 I like the connection you made between Van Johnson's facial scar and the emotional scars his character carries. He seems increasingly weighed down, and we feel his inner turmoil. I have to cut Robert Francis a little slack given the actors surrounding him; he just wasn't up to the challenge, though. It's really the cast that makes the movie work like you mention. So many are giving some of their best performances.